As you know by now, there is a new movie out called The Three Stooges. For some, this is one of the greatest travesties ever foisted upon the film-going public. How can anyone make a movie called The Three Stooges without the Three Stooges?!? I can certainly understand the outrage as I would probably have the same reaction if someone decided to remake I Love Lucy with imposters in the roles created by Lucille Ball, Desi Arnaz, Vivian Vance and Bill Frawley (and recent attempts to "reimagine" Bewitched and The Honeymooners are best left unspoken). So I get the ethical issues surrounding dressing up actors Chris Diamantopoulos, Sean Hayes and Will Sasso as Moe, Larry and Curly – real people with those names playing characters with those names in a total of 220 films. Of course, there were other Stooges who came in and replaced Curly (and, by the way, Shemp was in the original trio before Curly!) and Larry during their fifty year run. But the trio of Larry, Moe and Curly are regarded as the best Stooges. So how can anyone, particularly the Farrelly Brothers, have the audacity to make a new Three Stooges movie without the real Stooges (who are long dead anyways)? And it's not even a biopic with actors playing the actors while recreating some of their most famous bits! This is a full-fledged Three Stooges movie and it makes no apologies for being what it is. And you know what? It's hilarious! Seriously, it is. I went into the film expecting a complete train wreck because I was simply baffled by the previews I had seen out of context, but the story goes something like this: three boys of undetermined relationship are dropped off (more like tossed out of a car in a duffel bag) at an orphanage to be raised by the nuns (who never age!) and adopted out. Except the boys are such troublemakers that they are pretty much un-adoptable. When a couple decides to take Moe, he asks them to turn around and bring his two friends along as well, and they end up leaving him behind and taking another kid instead, the adorable Teddy. Years, later the adult Moe, Larry and Curly are still at the orphanage working as handymen, but their accident prone behavior has cost the orphanage to lose its insurance and the Archdiocese is closing them down unless they can come up with $830,000 in thirty days. Stooges to the rescue … or not. Now, your tolerance for the Stooges will determine how well you like this movie. The original films were mostly shorts because a little eye-poking, gut punching, hammer to the head mayhem can only go so far, so sitting through 90 minutes of this can be a bit tiring. The Farrelly Brothers have ingeniously crafted the film as three 30-minute shorts, but the story still runs the length of the entire film and there's no real breather between each episode (so this is like sitting through a marathon on TV without the commercials). While some may find this tiring, my level of enjoyment was sustained throughout the movie. I didn't laugh so much at the acts of violence the Stooges perpetrated on each other (although some of the things they did were quite elaborate), but the sound effects that accompany each punch, whomp and poke were hilarious (like the TV show Wipeout, this probably wouldn't have been half as funny without the sound effects). The story takes a couple of turns when the guys are hired to kill a dying man (it's a set-up! ), and when Moe somehow gets himself cast on Jersey Shore – which seems like a stretch, but it actually works (and who can't get some enjoyment out of the juice heads and pickle lovers getting smacked around a bit?). The cast acquits themselves nicely and look like they're having a great time, from Jane Lynch to Sofia Vergara and Craig Bierko to Stephen Collins. And you just can't help but laugh at Larry David as Sister Mary-Mengele, the Jewish nun who gets the brunt of the Stooges' violence over the years. But what about the guys playing the Stooges? I have to say the resemblance is eerie. Sasso, in my mind, seems a little too tall for Curly but he's got the voice and the mannerisms down perfectly. Diamantopoulos sounds exactly like the real Moe and has obviously done his homework to get the physicality of the man down to perfection. But the standout is Sean Hayes as Larry. Hayes completely loses himself in the role, and any questions that he can play anything but a flamboyant gay man should finally be put to rest. Moe is the ostensible leader of the Stooges, but with Hayes being the most well-known of the actors, Larry is the real stand-out of the group. I really could not take my eyes off of him whenever he was on screen. And let's not forget the kids who play the young Moe, Larry and Curly. All of them are outstanding. The Farrelly Brothers, who have made a career out of envelope pushing comedies, really haven't made a consistently funny (or good) movie since There's Something About Mary way back in 1998. 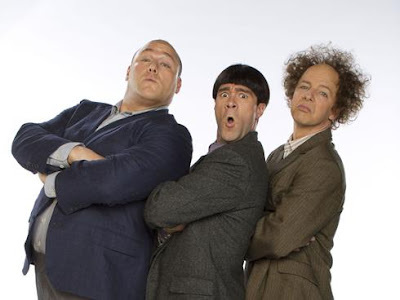 The Three Stooges has been a passion project for them for years, going through at least one false start with Sean Penn and Benicio del Toro cast as Larry and Moe (and one can only imagine what a real disaster that may have been), and they obviously love the Stooges. They've certainly done their homework, incorporating all of the Stooges' most famous bits into the film along with those classic sound effects, and for me, at least, I think they've succeeded in bringing the Three Stooges back to life for a new generation who may now go back and look at the classic Stooges for the first time. Yes, it is a little odd having actors playing these real people who created the Stooges in the first place, but they've kept the film in the spirit of the classics (the boys are eternally stuck in their 1940s era even though the film takes place in the present), never doing anything to besmirch the good name of the originators (which can't be said for a lot of modern remakes of classic properties). I know there are folks who are adamantly against this film and they will probably never see it or, if they do, never be able to crack a smile or chuckle even if they do see it because there's already too much resentment built up against the idea. I'm no devotee of the Three Stooges, but I am familiar enough with them to say that while I expected the worst going in, I came out a much happier person afterwards. The Farrelly Brother and their cast have done the impossible and made a terrifically funny movie – and it's extremely kid friendly (make sure to stay in your seats for the "Don't try this at home" message from the "Farrelly Brothers"). All I can say to the naysayers is try to have an open mind. The Cabin in the Woods - Don't Spoil It!